Beating the fan sections of Gonzaga, Kansas, Pitt, and others, the Rowdy Rams have earned VCU a top nod and a $10,000 scholarship prize. 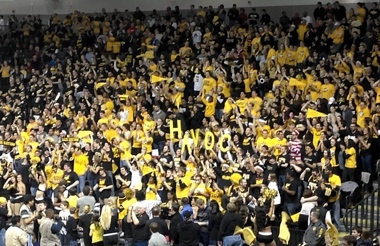 VCU’s student cheering section, the Rowdy Rams, won the second annual Naismith Student Section of the Year award, which celebrates the most passionate college basketball fans. The announcement came last night at the Siegel Center as the Rams played the UR Spiders. At total of 158 schools competed for the award beginning in January. VCU advanced through the first two rounds of public Facebook voting, earning the most votes of any school. The final eight schools — including Gonzaga, Indiana, Kansas, and Pitt — were evaluated by the Naismith1 Awards Board of Selectors. Criteria included the student section’s name, attendance, photos, video, write-up from the school, and weighed with scores from public votes. Catherine Gammon, Senior Vice President of Brand Development for the Collegiate Licensing Company who, along with the Atlanta Tipoff Club, presented the award, commended VCU’s fans. A $10,000 cash prize accompanies the award, which VCU will donate to the University’s general scholarship fund.